Your outdoor decking is meant to be the focal point of your summer nights and days. It will host your family and friends and so the set up must be convenient. Before you select furniture, think of the deck’s size and your habits. If you are a big family and like to dine outdoors with friends too, get a large dining table. If you rather cuddle in an outdoor sofa, it’s best to invest in cozy furniture for the seating area. Sitting on the wooden deck under a full moon is very romantic. But not all nights are the same and neither are your activities. You need ambient light in order to dine in a pleasant environment. But what if you want to read or get down to the lower level of your deck? Get plenty of lighting even if you don’t use it often. And don’t forget about deck stairway lighting. It will provide greater safety. 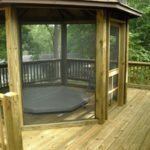 Part of your outdoor comfort is your ability to move around and do things without worrying about your privacy, the weather or anyone’s safety. So invest in custom pergolas too. If you worry about the weather, get a pergola with a closed or opening/closing roof. Get built-in benches that will create cozy corners. Increase privacy with screens. Install deck railing and don’t forget about the stair handrails. 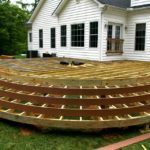 Whether or not you have a multi-layered wood deck, define the areas of activities. This way, the kids won’t give you a headache with their games when you are trying to dine with friends. If you like to chat on the phone, you won’t bother your children who try to do their homework outdoors. Place the dining area in a distance from the playing and seating area to create visual areas, clean lines, and peace of mind. It’s nice to have cozy seating areas in different parts on the deck. They provide convenience when you throw big parties and allow you to recharge your batteries in different parts of the yard. How to achieve that? For starters, use the stairs. Instead of investing in small and narrow ones, make them extra wide. You will have the room to throw colorful pillows and voila, an extra seating area will be created. An alternative would be the deck railing. If you don’t actually need one due to the low height of the deck, build a bench all around to create seats. 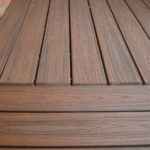 Low-maintenance cedar or ipe outdoor decking will enhance functionality. The point is to have a deck that won’t need treatment year after year but only once in a few years. So talk to your deck contractor about wood types and invest in timber types that won’t need care often. Who wants to prep food and then carry trays a mile away? You want everything in close range to make traffic easy between the indoors and outdoors. So if your kitchen has a view at the backyard, extend the deck all the way in front of your busiest home room and place the table right after the glass sliding door. Remember to leave plenty of room between the functional areas for easy traffic flow. If the deck is not close to the kitchen or is placed around the pool, get an outdoor kitchen. Place the table right next to it and enjoy barbeque with friends without having to move back and forth. The deck is supposed to be the place where you relax not the source of extra chores. So make it functional and enjoy every minute of the summer under the fool or new moon.